Despite killing bloody shitloads, the pets that were leaving the facility were going out undesexed, so it had become the norm for backyard breeders and puppy farmers to source their breeding dogs from the pound. To maximise the amount of money these people paid for their animals, Council had implemented a 'silent auction' style bidding process, which meant rather than be able to visit, choose and adopt a pet and take them home, families had to simply leave their details and hope they bid more than the local BYB. Blacktown councillors voted to adopt recommendations made in two reports about pound operations and policy. Former veterinarian and RSPCA boss Mark Lawrie compiled the reports, which say the desexing of animals given new homes may reduce the number of unwanted offspring returned to the pound. Dr Lawrie says the tender system, which requires prospective pet-owners to outbid each other, should be changed to a fixed-price system. He also said pound buildings and animal housings are run-down. Dr Lawrie’s reports said it would cost a lot, but that newer facilities should be built. Blacktown City Council’s mandatory desexing policy was hailed as the best way to cut down on the number of animals euthanised at its pound. The motion passed unanimously in May, despite initial opposition from Mayor Alan Pendleton, but one dog lover claims it is illegal for the animals to be desexed. John Carr wrote a lengthy submission to the council outlining why under the Impounding and Companions Acts it didn’t “own” the animals it impounded and therefore had no right to desex them. Mr Carr, who worked at several councils in the animal control field, said desexing violated the Prevention of Cruelty to Animals Act. “By desexing these animals prior to sale, I allege the council, and the veterinarians involved, are performing criminal acts and are leaving themselves open to litigation,” he said. Mr Carr, who has seven pet dogs of his own, said the animals taken to the pound were protected under the Prevention of Cruelty to Animals Act and council shouldn’t do anything that would prevent them from being rehomed. ... Mr Carr said council may sell or destroy an animal but had no legal right to desex it and the only way it could was with the consent of the owner, regardless of the time the animal had been in the pound. Cr Russ Dickens, a Blacktown vet, said the ‘worthless’ system should be eliminated. He introduced a no-kill policy late last year and said removing the tender process would help save animals on death row. In 2008, 1419 dogs and 3146 cats were put down at the council facility. For one Blacktown councillor it would be one his greatest ever achievements, while for nearly 8000 animals it’s the difference between life and death. Councillor Russ Dickens has expressed his desire to implement a ‘no-kill’ policy for animals at Blacktown Council’s Animal Holding Facility. Last year, the council said 1419 dogs and 3146 cats were killed at the facility. That’s 34.4per cent of dogs and a staggering 88.3per cent of cats from the 7,692 combined total of cats and dogs who at some pointed resided there. Cr Dickens, who is also a fulltime vet, said it would be one of his “greatest and proudest achievements” at Blacktown Council if he could implement a no-kill policy. “The euthanisation of animals is heinous, I’ve never liked it. It’s not through their own fault that they’re being put into pounds and then onto death row” he said. Earlier this month, Cr Dickens attended the 3rd National Summit to End Companion Animal Overpopulation, on the Gold Coast. Through the conference and his knowledge on how local and foreign animal holding facilities are run, Cr Dickens outlined a number of procedures Blacktown Council could undertake to ensure the venture was a success. This is not just a man standing around wishing lost pets would go away – he had a plan. His main point included desexing of all animals that come into the facility, but also included the introduction of a ‘trap, neuter and return’ program for feral cats. Allowing temporary volunteer foster care programs for animals when facility space was limited, is another initiative Cr Dickens endorsed, whereby animals could be returned to the facility when space became available. Cr Dickens said image was an important factor, as people are more likely to adopt when they are in inviting surroundings. “I go in there every now and then to check on the animals and right now it is a place of horror and it needs to be a place of happiness and hope,” he said. 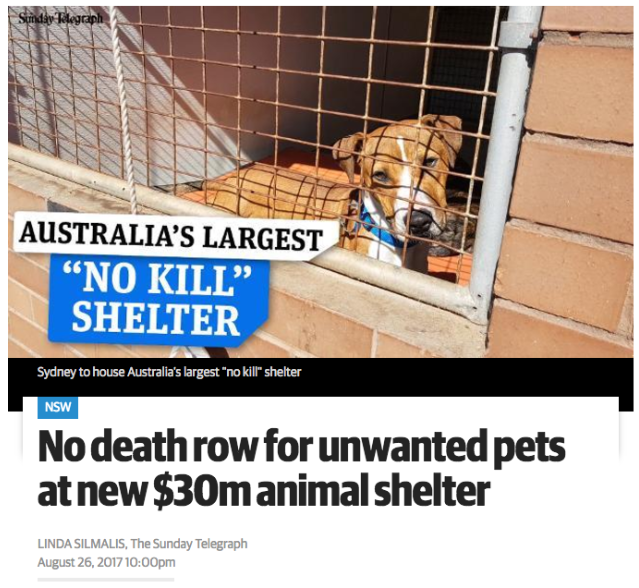 He cited Sutherland Shire Council’s animal shelter, whereby the no-kill policy is implemented and the shelter provides cats and dogs with play areas, toys and the cats even have their own beds. A spokesman for Sutherland Shire Council said animals are only killed in extreme cases when the animal is either seriously injured, old, ill or dangerous. In addition to current play areas for cats, there are plans to build a dog agility yard equipped with toys and devices to improve the dogs’ strength and coordination. So this councillor was pushing for desexing before adoption and for community cats, a foster care program, a welcoming surroundings which doesn’t send their animals nutty or drive away potential adopters, beds for the animals and ongoing behavioural support from the inside. You know, all the stuff we bang on about as how you replace killing, with things that aren't killing. While on the outside the community was also doing it's fair share of the heavy lifting, as Blacktown started to advertise their animals and the public responded by supporting their new, much fairer and more humane, adoption policies. Staff at the holding facility said the Pet of the Week (POW) article in the Blacktown Advocate (newspaper) increases their incoming calls and inquiries. “More often than not, the POW is sold almost immediately after going to print,” a worker told us. 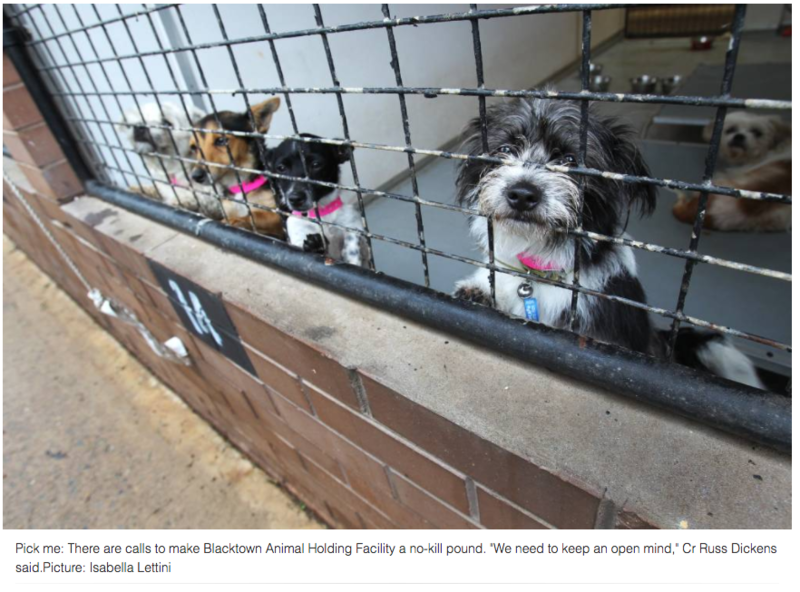 The volunteers who help make Blacktown’s Animal Holding Facility a more pleasant place for dogs and cats were hopeful of “drastic change” after a meeting last Monday night. About 15 volunteers were joined by dozens more, including representatives from animal welfare groups and Blacktown councillors Nick Tyrrell, Jess Diaz and Russ Dickens, to campaign for what they say are crucial and overdue changes at the pound. It was such a strong showing that chairman of the Blacktown City Council companion animals management advisory sub-committee Alan Pendleton was said to be surprised. The main issues up for discussion were a no-kill policy, meaning no rehomeable animal would be put down; the tender process which forced potential pet owners to bid on animals; the low staff to animal ratio – about 1:100 – the introduction of mandatory desexing and a set of standard operating procedures. Volunteers say they were surprised a basic operating procedure was only now being written up. After campaigning for up to 25 years on some of the issues, attendees were optimistic that at least some changes would be forced once the matters passed through the policy committee at the end of the month and were put to a vote. Volunteers say a general lack of staff is contributing to the suffering of animals. In one case, a matted malamute was left for days with maggot-filled sores on its back. It took three volunteers five hours to clip Bear, who is currently being nursed back to health. “Cruelty happens because of a lack of staff which leads to neglect,” a volunteer said. She told the Advocate volunteers often paid for vet bills because treatment was not authorised unless it was deemed “life-threatening”. Cr Tyrrell said staff should work with volunteers, who were giving up their time to ensure the animals were comfortable, not against them. He said it was time for the council to act on the lack of staff, enforce the no-kill policy, abolish the tendering process and move on mandatory desexing. “The idea that any dog or cat is leaving the pound undesexed means we’re contributing to the ongoing problem, instead of doing something proactive about solving it,” he said. A spokesman for the council said the no-kill policy and tendering system were among several issues under review. Pressure is building on Blacktown Council to produce a report into the operations of its Animal Holding Facility that it commissioned about 12 months ago. The report was to investigate changes to the pound’s tendering process and the mandatory desexing of cats and dogs. .... A council spokeswoman said in July last year that the report was expected to be tabled by the end of that month. At the Community Services Committee meeting last week, councillors called for the report to be produced at the next Policy Committee meeting on May 25. Cr Tyrrell, Cr Russ Dickens and the mayor Allan Pendleton told the committee meeting they all regularly received complaints about the way the pound was run. Cr Allan Green has also written to the council’s general manager Ron Moore after receiving complaints from the community. Animal lovers rejoiced as Blacktown Council made it mandatory to desex dogs and cats sold at the pound. The landmark decision was met by cheers from the public gallery at last Wednesday’s general council meeting. Veterinarian Dr Robert Zammit, who led the campaign, said desexing would reduce the number of animals euthanised at the pound. “To see that number of animals die is uncivilised,” he said. Councillor Kathie Collins, who moved the motion, said it would stop people from breeding dogs for illegal fighting purposes. “This is a good move on behalf of Blacktown City Council to come up with this recommendation and I trust the people in the gallery will see that we are making an effort,” she said. Blacktown Councillor Russ Dickens, a practising veterinarian, said the decision was long overdue. “Let me say thanks to my Labor colleagues who have finally seen the light,” he said. 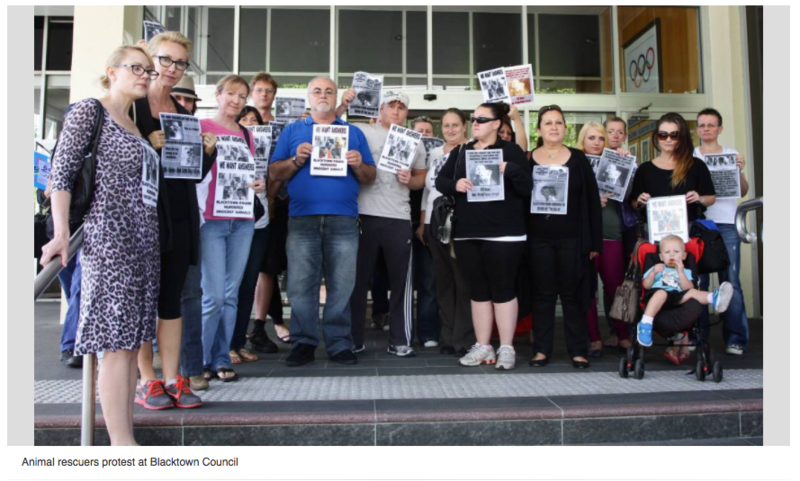 It was a demonstration of people power that gave Blacktown councillors no option other than to adopt immediate compulsory desexing of animals sold from its pound. As the Sun reported last week, Labor councillors were set to push through an alternate voluntary policy that would have seen only a fraction of the nearly-8000 cats and dogs impounded each year desexed. Councillors said they were inundated with emails from residents and animal welfare advocates all over Australia calling for compulsory desexing. The policy was passed unanimously and a packed gallery broke into elated applause. The protesters arrived at the council building about an hour ago. Animal Welfare League chief executive officer Tim Vasudeva says he was never asked by Blacktown Council to assess the dogs for euthanasia. ‘‘If asked, I would reject it,’’ he said. ‘‘It’s not our job to do this. Mr Vasudeva said his organisation was asked to provide training to council pound staff to help them choose the right animals to be adopted by suitable people. ‘‘This is the main aim in the introduction of temperament testing,’’ Mr Vasudeva said. One of its strongest critics — animal campaigner Melanie Norman of Pound Rounds Inc. — said the killing of the two dogs had shown the ugly side of the council and people who dumped their pets. ‘It’s becoming obvious that councillors are the very irresponsible public they blame for the killing in pounds,’’ she said. ‘‘Both these dogs were held in the most trying circumstances for months and then killed, on temperament grounds, for not coping. future of Blacktown Animal Holding Facility is set to be a hot topic at Wednesday night's council meeting. … a spokeswoman for animal welfare group Pound Rounds, urged councillors to not let politics get in the way of saving animals' lives. Dozens of people took to the Blacktown Mayor Stephen Bali's Facebook page in late May to air their concerns about the facility. Animal welfare advocate and zoologist Tina Bellamy, who rescues cats from the facility, said that, when the cats were impounded, the council was failing to properly market them to find them new homes. "The council has a duty to find alternatives to euthanasia if practicable," she said. Blacktown Council's animal advisory subcommittee held a think tank last night to come up with better strategies to reduce killing rates at the pound. It was in response to the council's draft companion animal re-homing policy, devised to establish how long unwanted animals would be held at Blacktown Animal Holding Facility. Of the 3251 cats presented to the pound in the current financial year, 59 per cent were destroyed while 29 per cent were re-homed. The other 2 per cent were returned to their owners and 10 per cent were sold. The death rate for dogs was much lower, at just 8 per cent. The report recommended price barriers to animal adoption be removed before death is considered and price reductions be introduced at one to 14 days. If an animal has been at the pound for more than 14 days, it's proposed animals be offered for free, apart from a lifetime registration fee of $51 for non-pensioners and $20 for pensioners. The policy was deferred three weeks ago to give rescue groups a chance to have input. "Your side is all about consulting the community," Cr Russ Dickens told Labor councillors. "We need to make an informed decision these groups feel they've been a part of." Cr Dickens is also a vet and chairman of the council's animal subcommittee. "Reducing the price isn't going to solve all the problems," he said. There was reaction on the Star's Facebook page: "Seven cats were killed at BAHF yesterday without warning," posted Butterfly Wings Animal Rescue group founder Sue-Anne Hill. "I know at least one of them had rescue working to get it out but the pound killed him without notification"
Thanks to enormous amounts of hard work, the pound began to evolve into something that more accurately reflected the pet-loving Sydney community. And now Blacktown is building a pound which is designed to demonstrate exactly how the community expects their pets to be cared for. Every dog... will get its day, lots of them, at a new animal shelter that won’t put pets on death row. Unlike other council shelters, where more than one in six dogs are euthanised, the ambitious new $30 million Animal Re-Homing Centre will find homes for all pets deemed “adoptable”. More than 10,000 dogs, cats and other animals will be re-homed each year from the 10.5 hectare property at Glendenning in Western Sydney. In a move dubbed the first of its kind, behavioural experts will assess each dog to determine the best type of home it requires, with those deemed “adoptable” given no time limit on their stay. With the final design work almost complete, the council is seeking to partner with the state government to realise the ambitious project. The council has asked the government to match its financial contribution. With Sydney University School of Veterinary Science on board as a partner, Blacktown City Mayor Stephen Bali said construction will begin as next year. “The council has re-imagined the whole concept of rescuing, caring for and rehoming abandoned and unwanted animals with a new, integrated animal rehoming centre,” he said. “The facility will have the capacity to manage stray and unwanted animals from far beyond the boundaries of its Blacktown Local Government Area. Now this is obviously excellent news, and we should all celebrate this announcement. However this excitement needs to be tempered with an understanding of the history above. Council has not done the right thing under its own steam, it has been pushed - every day, over literally years to decades - into the compassionate decisions it has made, by the community of Blacktown, greater Sydney, and indeed nationally. “All councils are facing the dilemma of ageing animal holding facilities and new stricter State Government animal welfare regulations that very few council facilities could comply with,” Cr Bali said. “Many will have to rebuild their existing ‘pound’ facilities. Blacktown is offering to take the problem off their hands. With our new Centre we could accept the dogs and cats from around a quarter of metropolitan Sydney. We have seen before with the 'mega pound' model of the Lost Dogs Home and RSPCA, what happens when too many eggs of community pound infrastructure are placed in a single basket owned by a single operator. 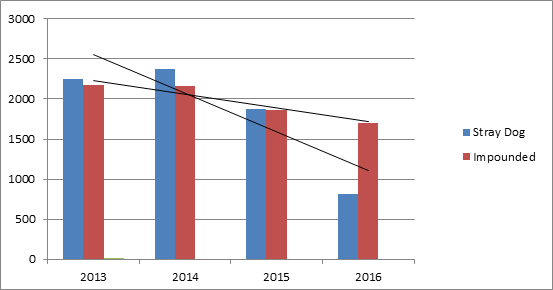 Given what we know about the history of Blacktown Council and its decisions about how it chooses to care for animals, animal advocates should be extremely cautious about any plans to expand their operations to even more than it's already nine council areas before it's actually reached its existing No Kill goals. Especially given just a short five years ago, they were still fighting against desexing before sale. My advice to locals? Support enthusiastically, but cautiously... and with a requirement for MASSIVE amounts of transparency. Just in case. Blacktown City Council will today launch a far-sighted plan to build a state-of-the-art Animal Re-homing Centre (ARC) planned to be the most advanced in Australia. When complete it could accept all the lost, stray and abandoned animals from up to 15 neighbouring council areas, representing about 1.5 million Sydney residents. Mayor Stephen Bali said the ARC was a great opportunity to provide pet accommodation support for victims of domestic violence and for greyhound rehoming. “We know there is evidence that many women feel unable to leave their abusive situations because they are unable to find accommodation which will also take their pets”. The project has won support from Australia’s best known vet, Dr Katrina Warren, who will help launch the ARC plan today. “This is an extraordinary step forward in the way local governments manage abandoned animals and find new homes for as many as possible,” Dr Warren said. - a pet boarding facility with space dedicated to caring for the pets of victims of domestic and family violence who are prevented from fleeing violence by the presence of family pets. Mayor Stephen Bali said the project put Blacktown at the vanguard, both in animal care and municipal leadership. “The ARC will be world’s best practice in re-homing. It will be a model for state and local government all over Australia,” Cr Bali said. The ARC will be built on a 10.5 hectare site Blacktown Council owns at Glendenning, adjoining Western Sydney Parklands and linked to it by walking and cycling paths. When complete it will attract hundreds of visitors a week and re-home many thousands of animals every year. “Council has provided land worth $15 million and will spend more than another $15 million building the ARC. To gain the full benefits of the project for Greater Western Sydney, we need the State Government to stand with us,” Cr Bali said. Blacktown City Council starts work this year on a new Animal Holding Facility at Glendenning – the first custom-built rehoming centre of its kind in Australia. “To be fair, we should start calling it an Animal Re-homing Facility, rather than an Animal Holding Facility,” the Mayor of Blacktown City, Councillor Stephen Bali said. “We do much more re-homing and adoption than holding, and this will be our focus in the future,” he said. This year’s Council budget allocates $8.3 million for the construction phase of the new facility, located on Owen St, Glendenning. The new AHF will replace the existing facility in Prospect, which will be sold to fund part of the project. “Seven other Councils rely on Blacktown City Council to provide Animal Rehoming facilities, and the University of Sydney will be establishing a veterinarian training school, so we will be approaching the State Government for funding assistance,” Mayor Bali said. “The Animal Holding Facility on Flushcombe Road was built in the 1970s and, while it has served the community well, it needs to be replaced,” Mayor Bali said. “The new custom-built AHF will be able to house twice as many cats and dogs and will have outdoor exercise yards, a veterinary clinic, expanded facilities for poultry and other small animals, offices and a retail area. “It will be a modern, eco-friendly, welcoming and spacious facility based on best practises for animal holding. “Rather than locking animals away, it’s about as making the animals as comfortable as possible while encouraging the public to adopt animals rather than buy them from pet stores. The new complex will provide 100 dog kennels, accommodation for 100 cats as well as an outdoor cat play area, provision for poultry and other small animals, exercise yards, reception, retail and office areas, animal adoption areas and a veterinary clinic. The work includes an upgrade to the existing Canine Club on the site and new parade grounds. By comparison, the current AHF in Prospect has 72 kennels and 50 cat cages. Construction starts this financial year (early 2018) and will take two years to complete. Blacktown City pet owners seem to be heeding calls to take better care of their canine companions, according to the latest Council data. Over the last four years, fewer dogs have been ending up as strays on local streets and in the Animal Holding Facility, Mayor of Blacktown City, Councillor Stephen Bali said. “The number of stray dogs has more than halved from 2,252 to about 800, while the number of impounded dogs has also dropped significantly to a four-year low of 1,700,” he said. “This is particularly pleasing, given our population has grown rapidly in that time. “I congratulate all the pet owners who do a great job looking after their furry friends, and I encourage them to keep up the good work. Companion Animal Advisory Committee Chairperson Councillor Chris Quilkey said the figures showed Council’s pro-active pet education campaign was working. “Council has ramped up all aspects of its responsible pet ownership program over the past four years,” he said. “The employment of our full time animal education officer, Jacqueline Benito, has been a key to driving these improvements. “Jacqueline regularly holds animal education programs at schools, libraries and community events to raise awareness about how to properly take care of pets. “Other initiatives include subsidised pet desexing and free microchipping days. Ms Benito said it was wonderful to see the positive effects Council’s education campaigns were having. “The onus is on the pet owner to be responsible, but it’s up to Council to lead the way,” she said. “Australia has one of the highest rates of pet ownership in the world, but there are still people who don’t have pets.